After our previous GoPro decided to take a permanent vacation in the ocean, we picked up the new GoPro Hero 6 Black. We spent the first week testing out all of the features and came back with a better grasp of the camera's capabilities. Watch the video below for the full GoPro Hero 6 Black Review. 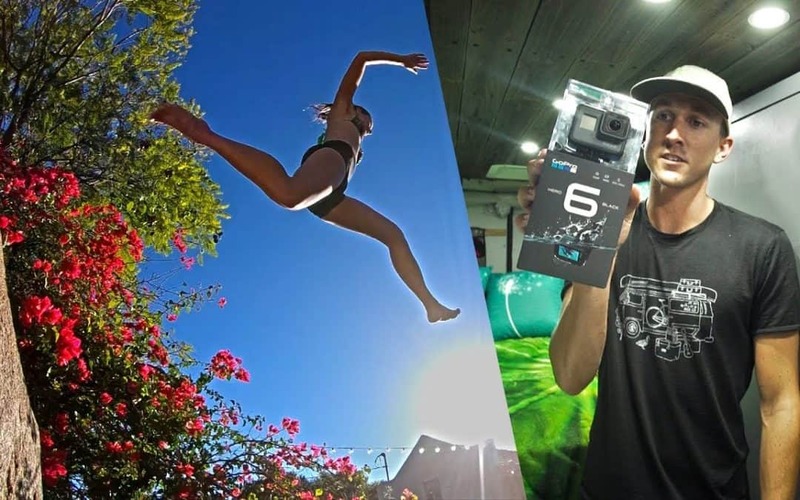 Click HERE to purchase the GoPro Hero6 on Amazon! What comes in the box with the GoPro Hero 6 is the GoPro camera itself, one quick adapter mount with thumb screw, one curved sticky mount, one flat sticky mount, charging cable, one battery. This GoPro Hero 6 shoots at 1080p resolution for 240fps. What does that mean? That means you'll be seeing a LOT more slow motion footage in our vlogs going forward! The clarity on each frame is incredible and makes grabbing screenshots from our travels much easier. New Processor developed by GoPro. This new GP1 processor is supposedly 2 times faster than the old processors. Although we can't 100% say that it's 2 times faster, it is definitely a faster camera at processing than the GoPro Hero 4. The image quality with high dynamic range works great in this camera. The color is great right out of the camera and requires a lot less post production editing, which we always appreciate. The internal stabilization is a world away from the GoPro Hero 4! This is in part thanks to the new GP1 processor, which included upgraded stabilization. Voice Commands. This is a really cool feature that was also present on the GoPro Hero 5, but not on the previous versions that we've had experience with in the past. Voice commands allow you to control the camera without using your hands. This is great for grabbing those shots while we are skiing, climbing, biking, or whatever else we may be doing that makes it difficult to use the buttons. The voice commands for turning the recording on and off work great, although it seems to be a bit more sensitive when trying to turn off the camera entirely. The GoPro Hero6 has a much higher quality microphone, although it still does not allow for an external microphone to be added. We would've liked to have that option, but settling for higher quality right out of the camera isn't too bad either. Out of the box, the GoPro Hero6 comes with one battery. We highly recommend picking up one or two extras for the camera. If you are reading this review as soon as it comes out, then note that the battery linked here is the correct battery for this camera, although it says it is for the GoPro Hero5. They use the same battery and it seems the descriptions have yet to be updated on Amazon. While we haven't tested every feature of the camera just yet, we are happy with the overall functionality this camera brings. We will continue using the camera and testing out features as we go along in our travels, so stay tuned for a more in-depth updated review of the GoPro Hero6 in the future. Note: links on this page contain affilliate referrals. We make a small commission off of purchases made from these links, although it does not change the cost to you. We appreciate your support!